The newly-completed, segregated bike lanes running along King Street in uptown Waterloo are now available for use by the public, after over a year of delayed construction. This construction is another phase of the uptown Waterloo streetscape project, a concerted effort by the Uptown Waterloo Business Improvement Area (BIA). Their goal is to make King Street more accessible for pedestrian and vehicle traffic, create an environment that is more accessible and attractive to visit and exist in and to improve the overall quality of businesses and economic life in Waterloo. The lanes, which officially opened in July, are entering the final stages of completion. Scheduled for September is the final layer of asphalt to be applied, which will be followed by the permanent pavement markings being installed, such as green paint at cycling crossings for visual clarity. Eric Saunderson, senior project manager for the Region of Waterloo, is appreciating the feedback that he has been receiving about the new lanes. “We continue to see that there are a number of cyclists that continue to use the [bike lane] facilities, more than what I expected, certainly from an initial opening perspective,” Saunderson said. “It is essentially a cyclist detection loop embedded in the concrete bike lane in bike lanes on both sides of the street and it is counting the number of cyclists on a daily basis, which is going to be used by the region and the city as part of our ongoing monitoring of the new streetscape,” Saunderson said. These bike lanes, as well as those in the future, are different from bike lanes which currently exist throughout the city, as they are a more efficient construction. 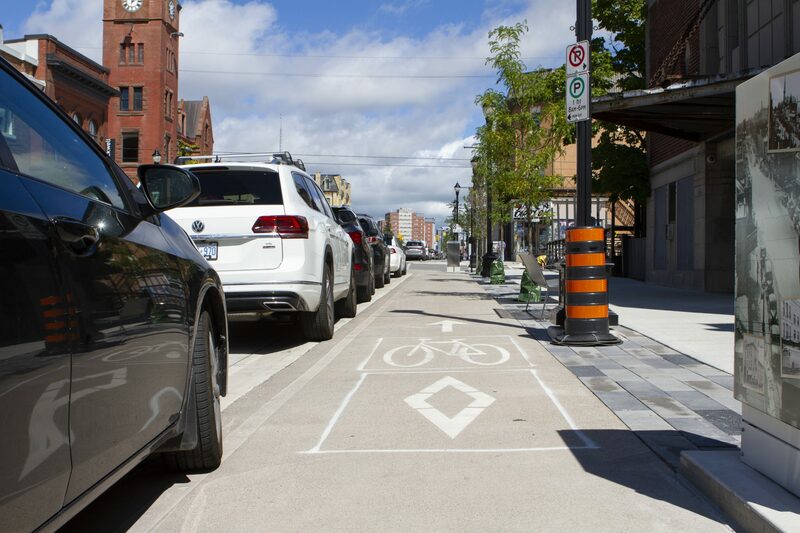 “Ours in uptown Waterloo has a different type of curb, which elevates the bike lane more from traffic, it has the on-road parking element as well — as [it deals with] increased pedestrian volumes and so forth,” Saunderson said. There are plans for more of these kinds of segregated bike lanes in Waterloo, including plans to continue construction up to University Avenue in 2020 and the King and University Avenue intersection by 2023. This will be done following a series of detailed environmental assessments in the area to determine its efficacy. The next stage of this construction is scheduled to begin next spring, north of Bridgeport Road, up to Spring Street. “We [also] currently have a project underway on University Avenue, between Westmount and Erb, passing through the Keats Way intersection, which will have segregated bike lane facilities as well,” Saunderson said. As far as the issue of using these bike lanes as parking spaces, Saunderson is convinced that the difficult transition period has now been alleviated. As members of the city by-law and Uptown BIA communicated the changes made to the streetscape, notices to avoid parking were distributed to businesses and those in the UpTown area, indicating the restriction to parking that would be later enforced with the end of construction. “Since that has occurred, I have been witnessing very few instances where people are still using it, but I know it is still a bit of a learning curve,” Saunderson said. Concerning general feedback, the City of Waterloo made the desire for these segregated bike lanes loud and clear. “It was about 60 per cent, of the people that were interviewed, [that said they] would cycle more or consider cycling more if they felt more comfortable cycling next to traffic”, Saunderson said. With safety in mind, these bike lanes are going to have a significant impact in reducing collisions or incidents involving cycling and pedestrian traffic. “Quite simply, there weren’t any facilities there before, and this section of King Street had some of the highest collisions involving pedestrians, cyclists and sideswipe-type collisions, collisions involving parked cars and transit vehicles,” Saunderson said.